LEARN JAVA GUI APPLICATIONS has 9 lessons covering object-oriented programming concepts, using a integrated development environment to create and test Java projects, building and distributing GUI applications, understanding and using the Swing control library, exception handling, sequential file access, graphics, multimedia, advanced topics such as printing, and help system authoring. The focus of LEARN JAVA GUI APPLICATIONS is to use the existing objects and capabilities of the Java Swing library to build a wide variety of useful desktop applications. Some of the applications built include: Stopwatch, Calendar Display, Loan Repayment Calculator, Flash Card Math Game, Database Input Screen, Statistics Calculator, Tic-Tac-Toe Game, Capital City Quiz, Information Tracker (with plotting), Blackjack, Line, Bar and Pie charts, a version of the first video game ever – Pong, and a Telephone Directory (Project Screen Shots). LEARN JAVA GUI APPLICATIONS is presented using a combination of over 1000 pages of course notes and over 100 practical Java GUI examples and applications. To grasp the concepts presented in LEARN JAVA GUI APPLICATIONS, you should possess a working knowledge of Windows (or other operating system) and have had some exposure to Java programming concepts. We offer a Beginning Java programming tutorials BEGINNING JAVA and that would help you gain this needed exposure. This course requires Windows 7, 8, MAC OS X or Linux. You also need the ability to view and print documents saved in Microsoft Word format, and Sun Java. To complete any of our Java tutorials, you need to have a copy of the Java Development Kit (JDK) 8th Edition installed on your computer. This is a FREE product that can be downloaded from the Java website. This site contains complete downloading and installation instructions for the 8th Edition of Java. You can also download all Java documentation from this same site. Look for the Standard Edition of Java (Java SE). This tutorial also uses NetBeans 8 as the IDE (Integrated Development Environment) for building and testing Java applications. This tutorial is now delivered in a PDF, Mobi, ePub & Word E-Book format. The entire E-Book and/or selected chapters can be printed on your local printer and/or viewed on your computer screen. The E-Books can be downloaded from our website immediately after purchase. We compress all download files using a .zip format to help reduce the size of files for faster downloading. We sell this unique E-Book Tutorial in a annually renewable Unlimited User Teacher Edition. Our Teacher Edition allows you to distribute the tutorial and source code to any of the students who attend your computer science class. You can customize and personalize the tutorial and the associated source code to fit your unique teaching style whether the class is self study or instructor led. Since this Tutorial is distributed in an editable Microsoft Word format you can add your own teaching text and/or notes around our teaching text. You can add your own diagrams and/or personalize the E-Book tutorial to fit your specific teaching needs. Unlike other Tutorials that are exclusively paper or PDF based, you can modify our teaching narrative and source code inside the tutorial and reprint as needed. This unique flexibility sets us apart from all other tutorials on the market. 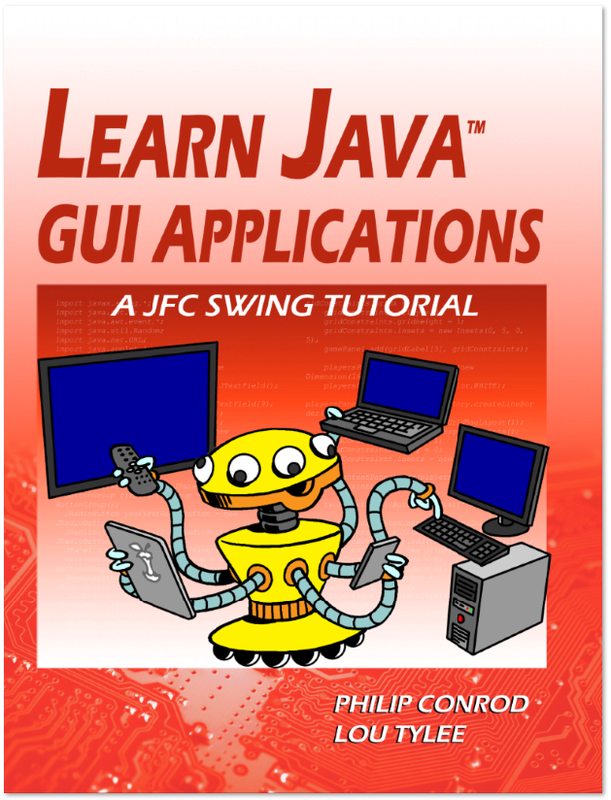 What is “Learn Java GUI: A JfC Swing Tutorial” … and how it works. The lessons are a highly organized and well-indexed set of tutorials meant for high school students and young adults entering post-secondary studies in Computer Science. NetBeans, a specific IDE (Integrated Development Environment) is used to create GUI (Graphical User Interface applications) by employing the Swing Controls of Java Development Kit Version 7. The tutorials provide the benefit of completed age-appropriate applications – fully documented projects from the teacher’s point of view. That is, while full solutions are provided for the instructor’s benefit, the projects are presented in an easy-to-follow set of lessons explaining object-oriented programming concepts, Java Swing controls, the rational for the form layout, coding design and conventions, and specific code related to the problem. Learners may follow tutorials at their own pace. Every bit of the lesson is remembered as it contributes to the final solution. The finished product is the reward, but the student is fully engaged and enriched by the process. This kind of learning is often the focus of teacher training. Every computer science teacher knows what a great deal of preparation is required for projects to work for senior students. With these tutorials, the research behind the projects is done by an author who understands the classroom experience. That is extremely rare! With these projects, there are lessons providing a comprehensive, student-friendly background on the programming topics to be covered. Object-oriented concepts are stressed. Once understood, concepts are easily applicable to a variety of applications. The “Learn Java GUI Applications” tutorials are organized by presenting relevant programming concepts first, fully drawn out examples second, followed by short problems where the student must recall the required programming concept with correct language syntax. Finally, exercises in the form of summative projects are presented at the end of the lesson. This graduated approach to problems leads to a high level of retention. By presenting lessons in this graduated manner, students are fully engaged and appropriately challenged to become independent thinkers who can come up with their own project ideas and design their own GUIs and do their own coding. Once the process is learned, then student engagement is unlimited! I have seen literacy improve dramatically because students cannot get enough of what is being presented. My History with Kidware Software products. I have used Kidware’s Programming Tutorials for over a decade to keep up my own learning. By using these lessons, I am able to spend time on things which will pay off in the classroom. I do not waste valuable time ensconced in language reference libraries for programming environments – help screens which can never be fully remembered! These projects are examples of how student projects should be as final products – thus, the pathway to learning is clear and immediate in every project. * Understanding the Swing Controls in the Java Software Development Kit Version 7, for Java for GUI applications, and more… it’s all integrated into the tutorials. In many States or Provinces, the above-listed topics would certainly be formally introduced in High School computer science, and would form the basis of most projects undertaken by students. With these tutorials, you as the teacher or parent may choose where to put the emphasis, to be sure to cover the curricular expectations of your curriculum documents. Any further computer programming topics derive directly from those listed above. Nothing is forgotten. All can be integrated with the lessons provided. Having projects completed ahead of time can allow the teacher to present the design aspect of the project FIRST, and then have students do all of their learning in the context of what is required in the finished product. This is a much faster learning curve than if students designed all of their own projects from scratch. Streamlined lessons focusing on a unified outcome engages students, as they complete more projects within a short period of time and there is a context for everything that is learned. With the Learn Java GUI Applications tutorials, sound advice regarding generally accepted coding strategies (“build and test your code in stages”, “learn input, output, formatting and data storage strategies for different data types”, build graphical components from Java’s Swing Control class libraries, etc..) encourage independent thought processes among learners. After mastery, then it is much more likely that students can create their own problems and solutions from scratch. Students are ready to create their own summative projects for their computer science course – or just for fun, and they may think of projects for their other courses as well! Different states and provinces have their own curriculum requirements for computer science. With the Kidware Software products, you have at your disposal a series of projects which will allow you to pick and choose from among those which best suit your curriculum needs. Students focus upon design stages and sound problem-solving techniques from a computer-science, problem-solving perspective. Students become independent problem-solvers, and will exceed the curricular requirements of their computer science curriculum in all jurisdictions. Useable projects – Out of the box! As you can see, there is a high degree of care taken so that projects are age-appropriate, and completely appropriate for senior computer science. How to teach students to use the materials. In a school situation, teachers might be tempted to spend considerable amounts of time at the projector or computer screen going over the tutorial – but the best strategy is to present the finished product first! That way, provided that the teacher has covered the basic concepts listed in the table of contents, then students will quickly grasp how to use the written lessons on their own. Lessons will be fun, and the pay-off for younger students is that there is always a finished product which is fun to use! Highly organized reference materials for student self-study! Materials already condense what is available from the Java SDK help files (which tends to be written for adults) and in a context and age-appropriate manner, so that students remember what they learn. The time savings for parents, teachers and students is enormous as they need not sift through pages and pages of on-line help to find what they need. In a classroom environment, it is possible for teachers to mark student progress by asking questions during the various problem design and coding stages. It is possible for teachers can make their own oral, pictorial review or written pop quizzes easily from the reference material provided as a review strategy from day to day. I have found the requirement of completing projects (mastery) sufficient for gathering information about student progress – especially in the later grades. Once concepts are learned, it is difficult to NOT know what to do for your own projects. This is true especially at the High School level – where applications can be made in as short as 10 minutes (a high-low guessing game, or a temperature conversion program, for example), or 1 period in length – if one wished to expand upon any of the projects using the “Other Things to Try” suggestions. Having used Kidware Software tutorials for the past decade, I have to say that I could not have achieved the level of success which is now applied in the variety of many programming environments which are currently of considerable interest to kids! I thank Kidware Software and its authors for continuing to stand for what is right in the teaching methodologies which work with kids – even today’s kids where competition for their attention is now so much an issue.